Bush Cookies is a long established baker of wholesale cookies. An Australian biscuit manufacturer and bulk biscuit suppliers to grocery retailers. We deliver wholesale packaged biscuits in bulk orders to retail stores. We supply overnight to Sydney Melbourne and Brisbane suburbs. Bush Cookies is a unique gourmet brand. You will find us in Australia’s gourmet grocers, green grocers, delicatessens independent supermarkets. You wont find us in the major supermarkets. 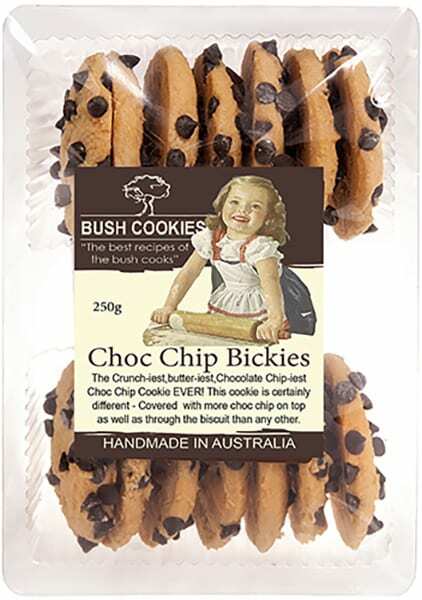 Bush Cookies is an Australian, family owned, registered business name. 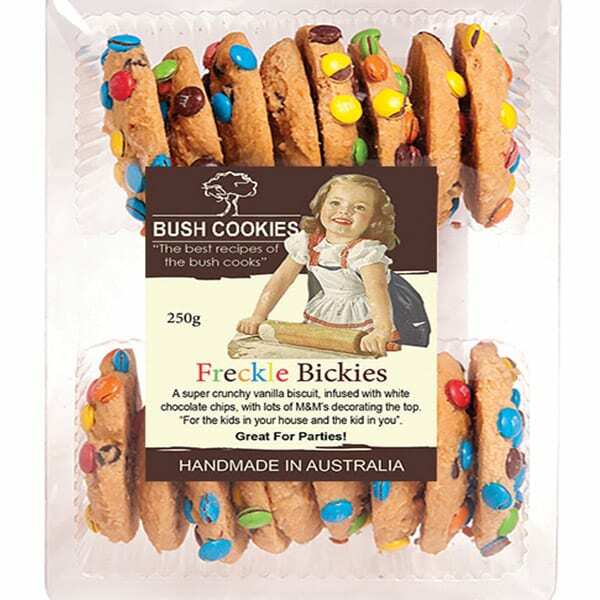 The original cookie supplies business, Aussie Bush Bikkies Pty Ltd was first established online in 2003. It operated from bakery premises in Port Macquarie NSW. Their mission, to sell, “Quality gourmet cookie supplies made to the highest standards. “Using 100% natural Australian ingredients and Australian bush fruits, nuts, honey and spices”. That company later failed from lack of capital. The bush biscuits and cookies were great however, and so the products of the business lived on. The new owners have further developed these great biscuit products with new flavors. 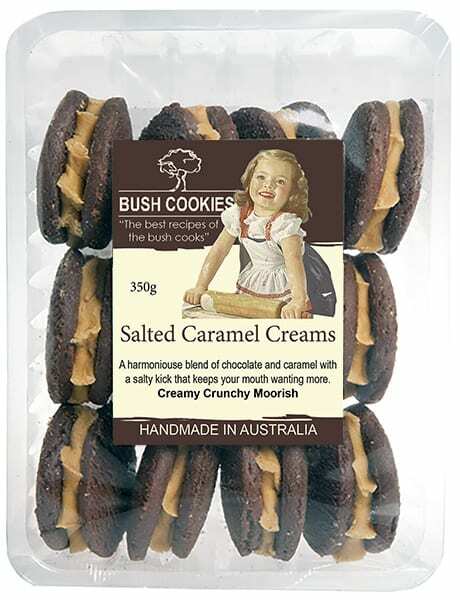 We have been trading as Bush Cookies and/or Bush Bickies, since 2011, and using our secret weapon “Nanny”. Nanny was one of the great Australian bush cooks. She was well known for her cakes & biscuits. Visitors would always get to take some home and she would often try something new. She always shared her recipes with family and friends. 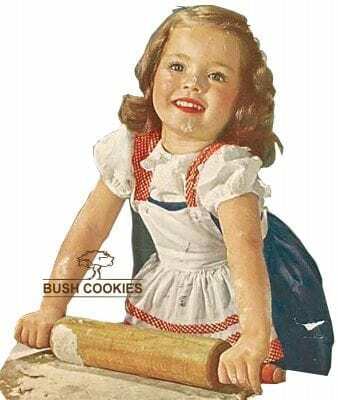 Nan always said that she learned to bake cookies when she was a tiny girl. She learned baking with her mother, but mostly with her own grandmother who she treasured in her heart. Bush Cookies are gourmet quality biscuits and cookies. They delicious and baked perfectly so take them proudly to any high tea party. 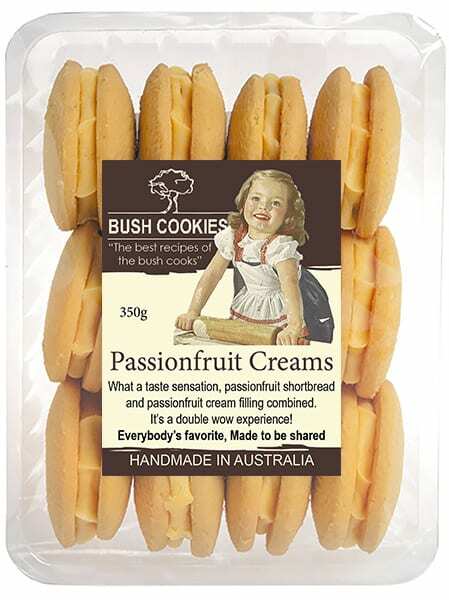 Bush Cookies are wholesale bulk biscuit suppliers to Australia’s gourmet grocers and retailers. Our range of 18 different packaged biscuits includes; Jam Drops, cream filled cookies, Anzac Biscuits, Choc Chip Cookies. Also; Melting Moments, Shortbread Cookies, gluten free biscuits, and other favorites. We invite you to review our list of cookies and biscuits in our online retail store. Wholesale buyers should click through to our parent company online shop. There you can Register for wholesale access to view bulk cookies wholesale prices. Our registered trading names are; Bush Cookies and Bush Bickies, also Bush Biscuits. They are wholly owned subsidiaries of Australian wholesale Food Suppliers (to Sydney Melbourne & Brisbane retailers), Opera Foods.